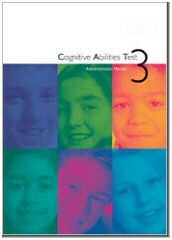 The Cognitive Abilities Test 3 (CAT3) is one of the most widely used tests of reasoning abilities. CAT3 measure three principal forms of reasoning – verbal, non-verbal and numerical – as well as an element of spatial ability. CAT3 can be administered by guidance counsellors, learning support teachers, classroom teachers and psychologists. Three types of age-related norms are provided for interpretive purposes - standard scores, percentile ranks and stanines. These allow you to compare the cognitive development of a pupil with that of other pupils of the same age. The data from CAT3 can be used to identify individual pupil potential and learning styles and enhance all aspects of the teaching and learning process, from organising classes to predicting future educational attainment. The CAT3 assesses an individual's ability to reason with and manipulate symbols representing words, quantities and spatial/geometric or figural patterns. Three batteries comprising nine sub-tests were constructed to assess competence in working with each of these types of symbols. Identifies pupils’ strengths, needs and learning preferences. Standardised scores allow you to compare your pupils’ results. Informs target-setting and the development of individual learning plans. A sound basis for year-on-year comparisons. Tests various reasoning abilities - numerical, non-verbal and verbal reasoning. In time will provide indicators of outcomes for the Junior Certificate Examination.